Dallas Arts Month. In homage to this milestone, A Decade of Art delves into the practice of ten disparate artists whose work will be displayed among this year’s exhibitors. From the narrative work of Faith Ringgold by way of Pippy Houldsworth Gallery (London), to press-shy Kirk Hayes, a trompe l’oeil dazzler showing with Conduit Gallery, there is a breadth of art to discover and collect for everyone. Setting the stage for the season, Dallas Arts Month begins with the Nasher Prize honoring “a living artist in recognition of a significant body of work that has had an extraordinary impact on sculpture.” In Material Matters, Auriel Garza highlights 2018 prizewinner Theaster Gates’ social practice and his inclusion as the first American artist in the burgeoning canon of Nasher Prize laureates. Not to be outdone, the month of May brings the gloriously diverse SOLUNA International Music & Arts Festival. While we look forward to exceptional artist collaborations from Jen Ray and Sarah Jaffe to Gregory Ruppe and Jeff Gibbons, we get misty knowing this celebration marks Jaap van Zweden’s final season as the Dallas Symphony Orchestra’s Music Director. Van Zweden will return, however, as Conductor Laureate and take up the baton for Mahler’s Symphony No. 1, March 14–15, 2019. 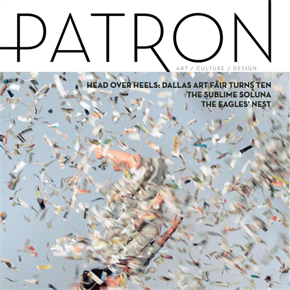 And SOLUNA will move to April next year to align with the Dallas Art Fair and Dallas Arts Month. Visual arts aficionados will love our featured home. In The Eagles’ Eye, by way of art advisor John Runyon, we explore Jennifer and John Eagle’s residence whose commitment to TWO x TWO for AIDS and Art is shown in their wonderful collection. John interviews the couple on their loyalty to the nonprofit affair and works they’ve acquired at the annual gala founded by Cindy and Howard Rachofksy. Fashion ushers readers to Brooklyn where Shayna Fontana tapped Liz Harlan from America’s Next Top Model to show the grit and glamour of the New York City borough, home to some of the top artists working today, like Arcmanoro Niles, also photographed by Shayna and featured in our fair coverage. Niles, who will exhibit with New York gallerist Rachel Uffner, tells us he’s looking forward to coming to Dallas this year as his friend Eric Fischl will be in town for his solo show If Art Could Talk at Dallas Contemporary. Because we’ve sprinkled in two different covers, depending on which issue you’re holding in your hands, we’ve featured either Rosemary Laing’s weather #6, whose work will be mounted by Galerie Lelong & Co., or Barbara Takenaga’s Atmosphere R, one half of a diptych to be installed in Gregory Lind Gallery’s booth; both exhibitors are at the Dallas Art Fair. We hope you enjoy the breadth of diversity in this issue and, as always, look to the arts to lead and make sense of it all.